While thatgame’s(ux) has focused primarily on video games so far, tabletop games aren’t exempt from needing user-centered design. The design of the rules book is an obvious place that usability can step in, but well-designed packaging is another one, as well as the construction of the game’s components. Back in February 2012 we talked about the great “progressive enhancement” that takes place in getting Set (the card game) up and running for new players. There are a lot of tabletop games that have a lot of small components. I can’t tell you how many times that during a game of Descent, and errant dice roll has caused quite a few miniatures to be displaced and a subsequent argument about where they were exactly. Especially the first edition where you were rolling (nearly) a million dice. But most of the time, it’s not a huge deal – either it doesn’t really matter, or someone remembers what square they were on. In a football sim like 1st and Goal though, the position of the football and first down markers are crucial to the game. A few yards in either direction does make a big difference. And while the magnets aren’t powerful enough to keep these tiny bits stable on a direct hit, they are strong enough to keep things in place if someone accidentally shifts the board. Without it, you’d be constantly fixing the position of that tiny football and I think it would really detract from the game. 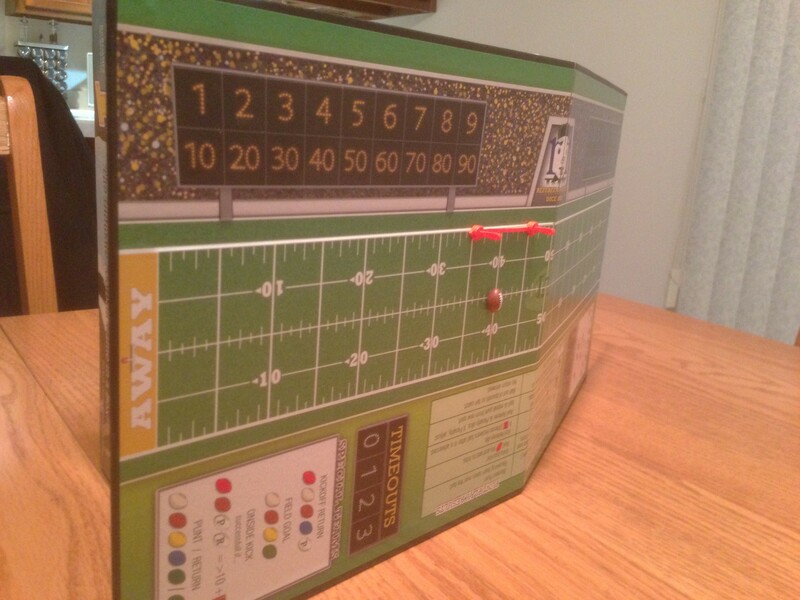 It’s hard enough positioning an oblong object exactly on the right yard marker – I don’t need any help forgetting how far I need to go to the first down marker! For me it was also a “surprise and delight” moment. Maybe because I’m an absolute sucker for magnets (how DO they work? ), but I was excited that it immediately solved a problem that I didn’t even know I had yet. It’s just a very cool touch…especially considering some of the other components in the box aren’t exactly world-class. Does a magnetic football make up for a ton of dice that you have to put stickers on yourself? It might. (note: I realize custom etched dice for this game would probably double the cost of it, but still, nobody likes stickering dice). Putting a magnet in your board game’s components isn’t rocket science, and it certainly isn’t possible (or necessary) for every game. But in this case it works beautifully, and really shows that the designer thought this one through to be usable in the real world of shaky tables, touchdown dances, and maybe even a spilled beer. Are there any other components in tabletop games that you think are particularly worthy of some usability attention? Let’s discuss in the comments! This entry was posted in Card & Board, Sports and tagged board game, game experience, usability, usability in gaming, user experience, ux by mark d. Bookmark the permalink.